The King British Algae Wafers Fish Food have been scientifically developed to meet the nutritional requirements of all Catfish, Plecostomus and other algae eaters. Made from the highest quality natural ingredients and packed with essential vitamins and minerals. 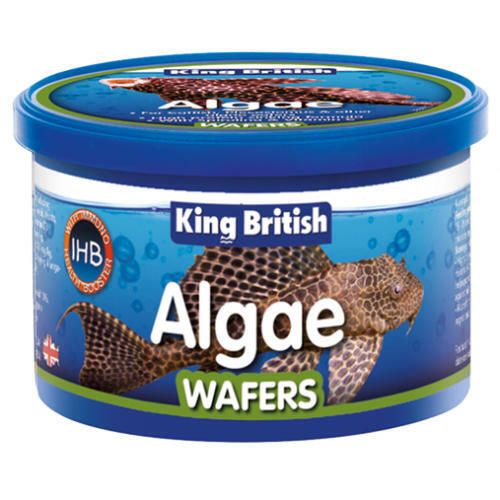 The King British Algae Wafers are a complete food presented as dark-green discs approximately 15mm in diameter. They are designed to sink and provide a balanced diet with 45% protein, developed to meet the nutritional needs of all bottom-feeding algae eaters including Corydoras, Loaches & Plecs. The vegetarian wafers contain both Vitamin C and our unique IHB 'Health Booster' to aid fish health. They are designed to remain stable in the water for up to 3 hours allowing grazing fish to take their time to eat the food.